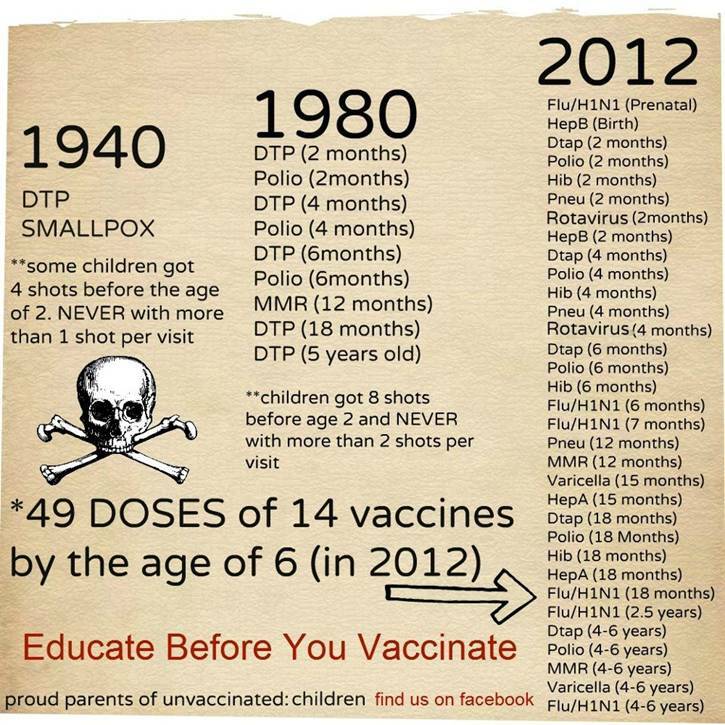 What they are not telling you about vaccines. had been difficult until the Internet exposed this betrayal of trust. infant mortalities of any other State? in direct proportion to their use? of American Physicians and Surgeons. 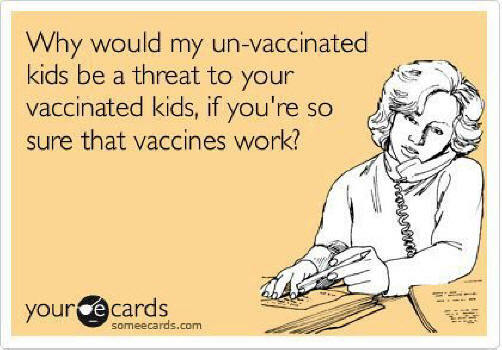 Did you know that the government has never done a study comparing the health of vaccinated and non-vaccinated children? Guess why? 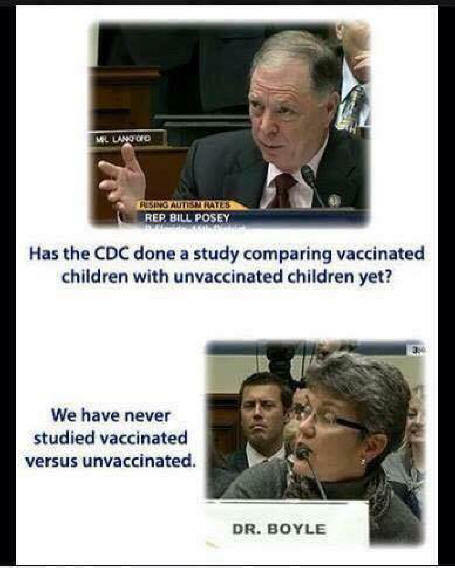 Watch a short video of the CDC's chief of vaccinations making excuses for why they won't do a study. 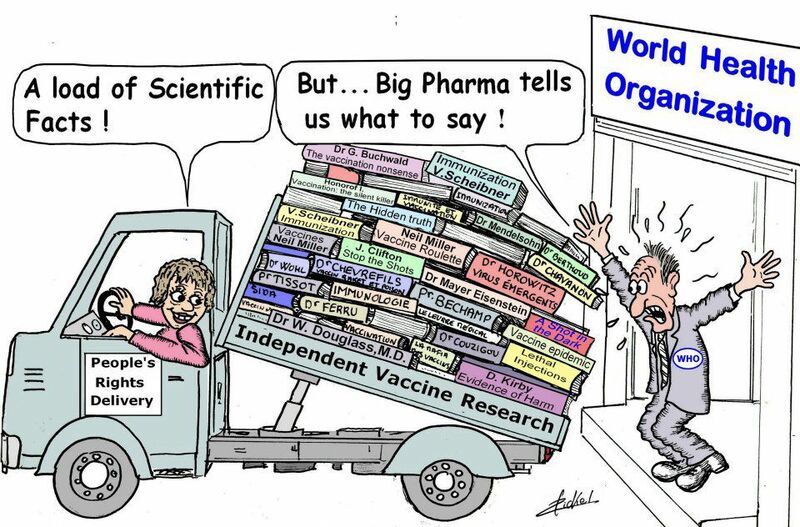 For more on the massive public harm from vaccines - and the economics behind this fraud - see concise summaries of deeply revealing vaccine news articles from reliable major media sources. The BEST recent VIDEO on vaccines HERE. 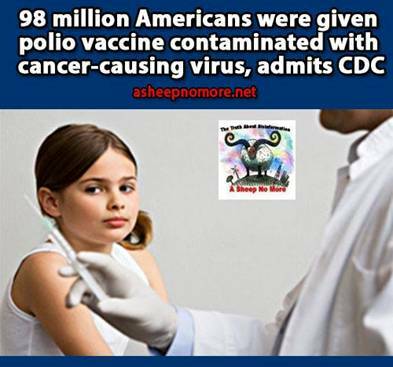 caused by MMR vaccines for 13 years. Connect the dots with a little Common Sense. modern sanitary practices with food, water and behavior. 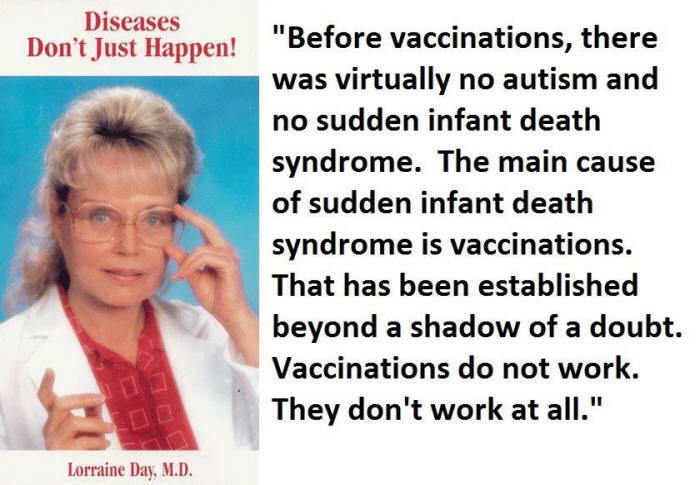 Big Lie, told repeatedly, is that vaccines eradicated them. Suspicions have been confirmed for those wary of vaccinating their children. and allergies than unvaccinated children. and make children more vulnerable to future infections. New science has actually put numbers to the question. 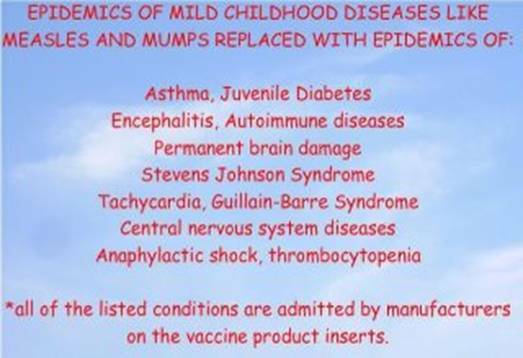 (NaturalNews) Breaking news June 28, 2012: According to two Merck scientists who filed a False Claims Act complaint in 2010 -- a complaint which has just now been unsealed -- vaccine manufacturer Merck knowingly falsified its mumps vaccine test data, spiked blood samples with animal antibodies, sold a vaccine that actually promoted mumps and measles outbreaks, and ripped off governments and consumers who bought the vaccine thinking it was "95% effective." and seed pathologies that may afflict optimal health for life. 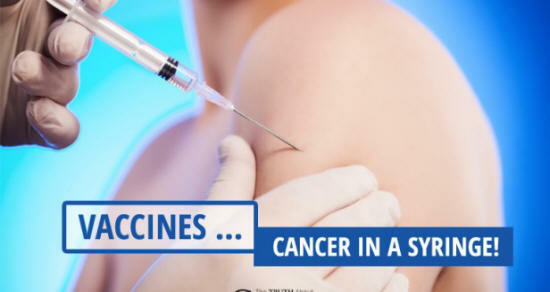 See the article: Vaccines…Cancer in a Syringe! 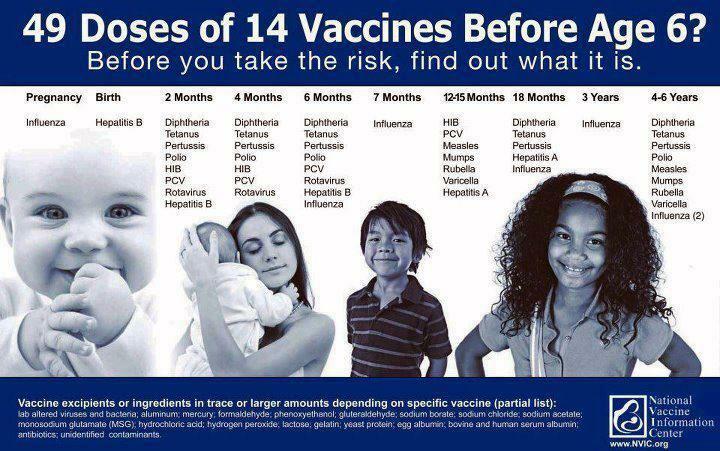 This following list of common vaccines and their ingredients should shock anyone. Are you surprised to see (above) that Aspartame is in vaccines? According to CNBC, “Paul Thorsen, the principal coordinator of multiple studies funded by the CDC used to deny a vaccine/autism link was indicted April 13th on thirteen counts of fraud and nine counts of money-laundering. 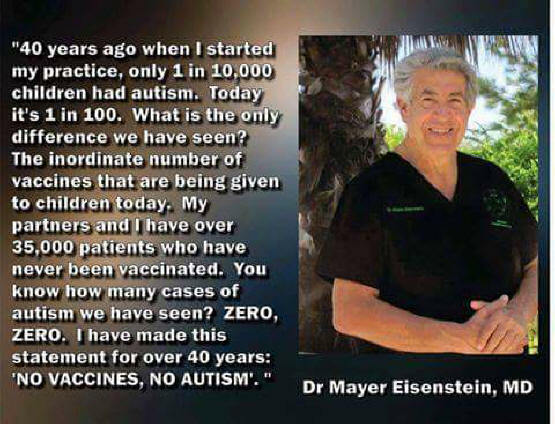 The charges relate to funding for work he conducted for the CDC which claimed to disprove associations between the mercury-based vaccine preservative, thimerosal, and increased rates of autism.” This was first reported by the consumer group, SafeMinds. I remember when these studies came out. They came out in rapid-fire succession just after previously-released studies began to show there was a link between autism and mercury-preserved vaccines. I was not surprised that the Thorsen articles came out so fast as Big Pharma had to do something to quiet the growing complaints about mercury in vaccines. Do I think that mercury-containing vaccines cause autism? Before I answer that, let me state a few points. 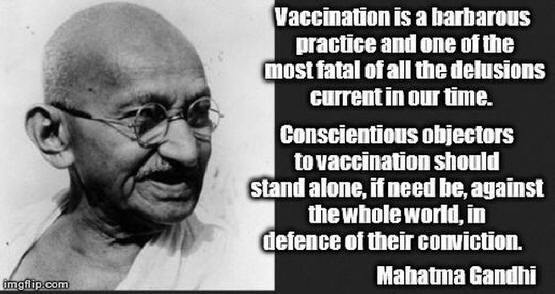 I believe there is no justification for ever injecting in any living being the third most toxic element known to mankind. As the wise man Forrest Gump said, “Stupid is as stupid does.” What do you expect will happen when you inject a known neurotoxin, in large amounts, to a small baby? I have no doubt that mercury toxicity, in large part from vaccines, is probably one factor responsible for the rapid rise of autism. Even if mercury is not one of the underlying causes of autism, common sense as well as biochemical sense would dictate that mercury exposure is not a good idea. In fact, mercury toxicity is a common problem in many of the patients that I see. However, in our toxic world, there are many other items we are exposed to on a daily basis that can also disrupt the normal neurological development in a newborn such as lead, arsenic, nickel, cadmium and bromine. What can you do? Number one; don’t let anyone inject mercury in your body. Most of the flu vaccines still have mercury in them and will have for many many years; they should be avoided. Next, don’t let any dentist put a mercury filling in your mouth. Any dentist that still defends the use of mercury does not understand biochemistry and does not deserve your business. Subject: Mercury in Vaccines being replaced with Aluminum !!! 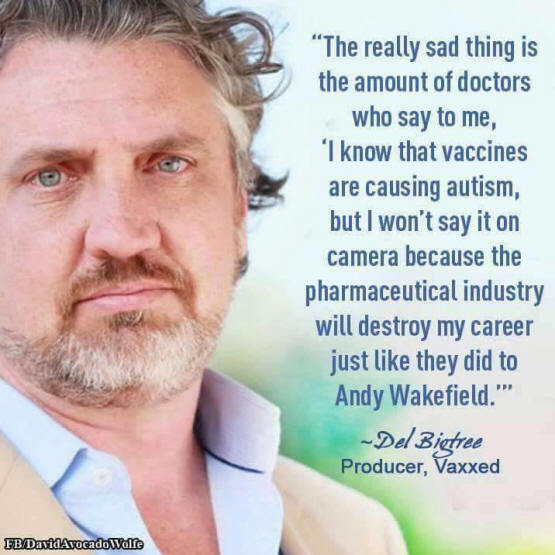 The short, eye-opening eBook is titled Aluminum in Vaccines -- a Neurological Gamble, by Neil Miller, director of the Thinktwice Global Vaccine Institute. It documents the hazards associated with aluminum-laden vaccines. Children are receiving high concentrations of aluminum in their shots. This well-documented neurotoxin may be more dangerous than mercury. 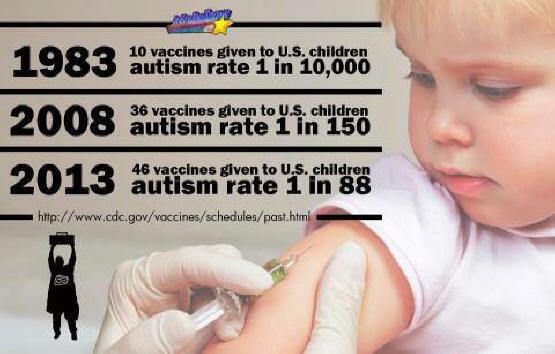 Vaccines containing high concentrations of neurotoxic aluminum were added to the child immunization schedule when several vaccines containing mercury were removed. 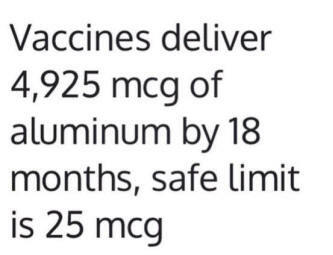 Two-month old babies now receive 1,225 mcg of aluminum from their vaccines -- 50 times higher than safety levels! Although the FDA, CDC and World Health Organization are aware of the dangers, they expect parents to play Russian roulette with their children. 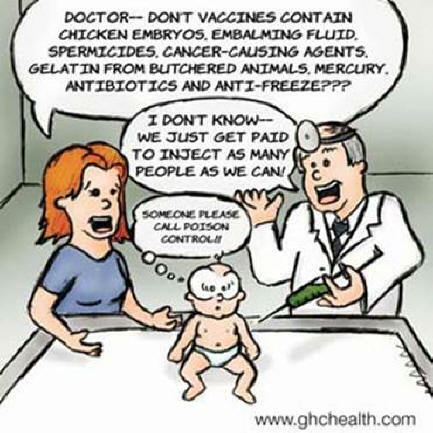 Vaccinations contain at least four neuro-toxins: mercury, formaldehyde, MSG and aluminum hydroxide. Researchers at the University of British Columbia have been looking at the possible effects of the fourth item in this list. They injected mice with anthrax vaccine containing aluminum hydroxide. After 20 weeks studying the mice, the team found statistically significant increases in anxiety (38 percent); memory deficits (41 times more errors than the sample group); and allergic skin reaction (20 percent). On autopsy, brain tissue samples showed that 35 percent of the cells were in the process of destroying themselves. According to Chris Shaw, lead researcher for the project, his research shows a link between aluminum hydroxide and symptoms of Parkinson's, Alzheimer's and Lou Gehrig's disease. "No one in my lab wants to get vaccinated," he said. "This totally creeped us out. 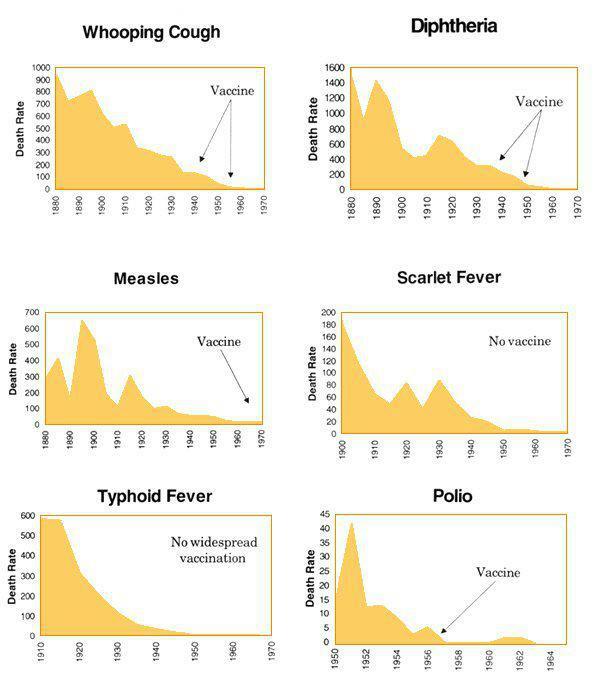 We weren't out there to poke holes in vaccines. But all of a sudden, oh my God -- we've got neuron death!" (NaturalNews) Like the infamous brownshirts who marched lockstep in obedience to their beloved dictator, nearly every major mainstream media outlet today is simultaneously and savagely ripping at those who choose not to vaccinate, calling for free-thinking parents to be jailed, have their children taken from them, and be forcibly injected with whatever vaccines the state deems necessary. 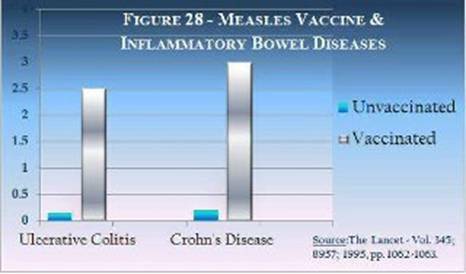 Is the medical establishment using fake crisis to push vaccination? The U.S.government declares that you can't sue vaccine makers if they produce a defective product or you suffer the side effects. 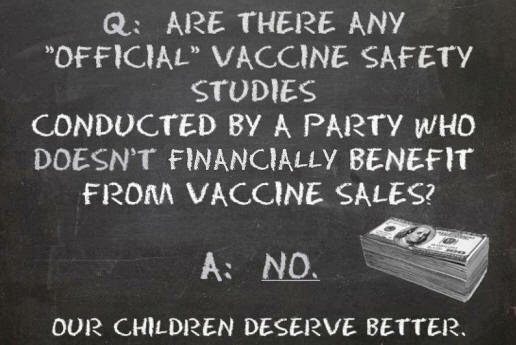 If vaccines are in fact safe and effective, why must we give up our rights? Or is that the agenda? Sat Jun 23, 2012 / When doctors had tried to suppress the symptoms of the typhoid with a stronger vaccine, it caused a worse form of typhoid which they named paratyphoid. 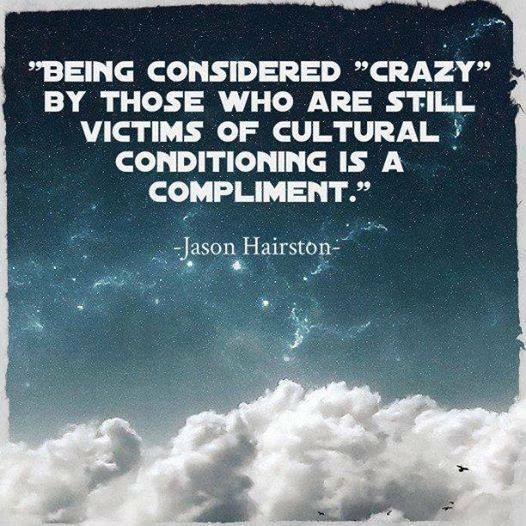 But when they concocted a stronger and more dangerous vaccine to suppress that one, they created an even worse disease which they didn't have a name for. What should they call it? 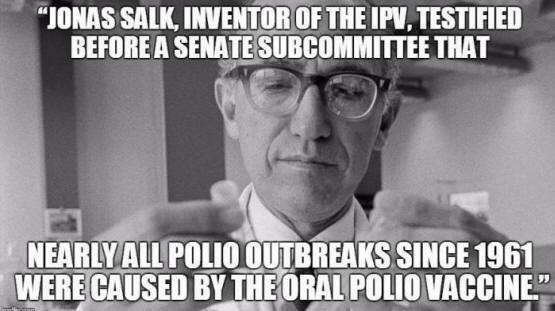 They didn't want to tell the people what it really was -- their own Frankenstein monster which they had created with their vaccines and suppressive medicines. They wanted to direct the blame away from themselves, so they called it Spanish Influenza. 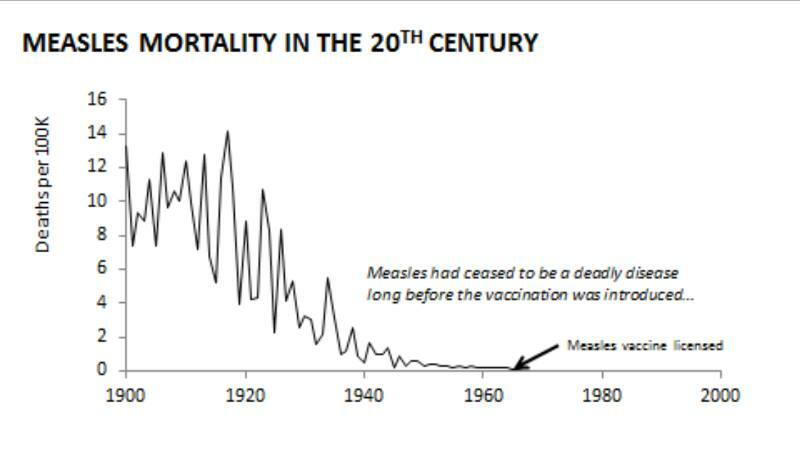 20 million died, and the cover-up was to glorify vaccines along with the other 'miracle medicines' that the medical-industrial complex was promoting. 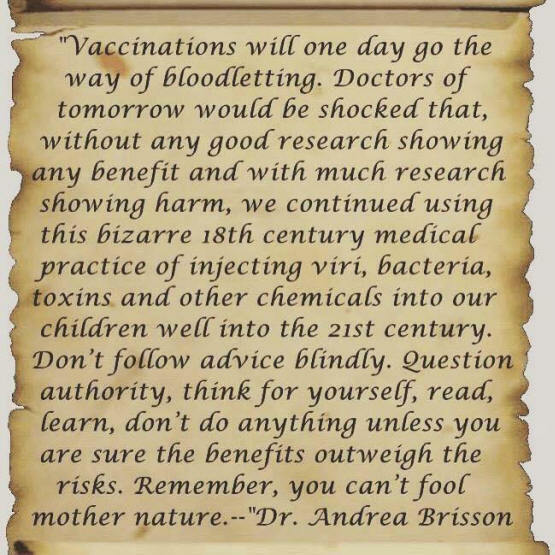 This virtually religious belief in the high priests of modern medicine with their drug 'sacraments' has carried vaccine programs to the present day.